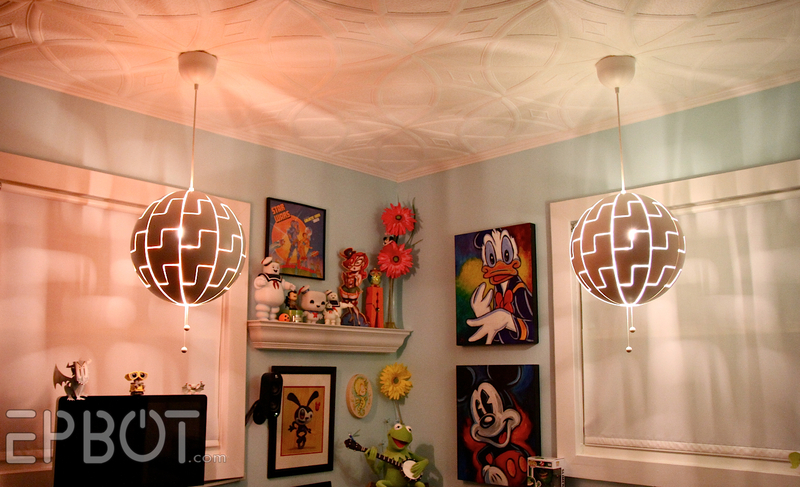 EPBOT: My New Death Star Lights! You know how it is; you go to Ikea for a $10 frame, you come out with a couple hundred dollars' worth of home decor impulse buys. No remorse this time, though, 'cuz lookie what I got! 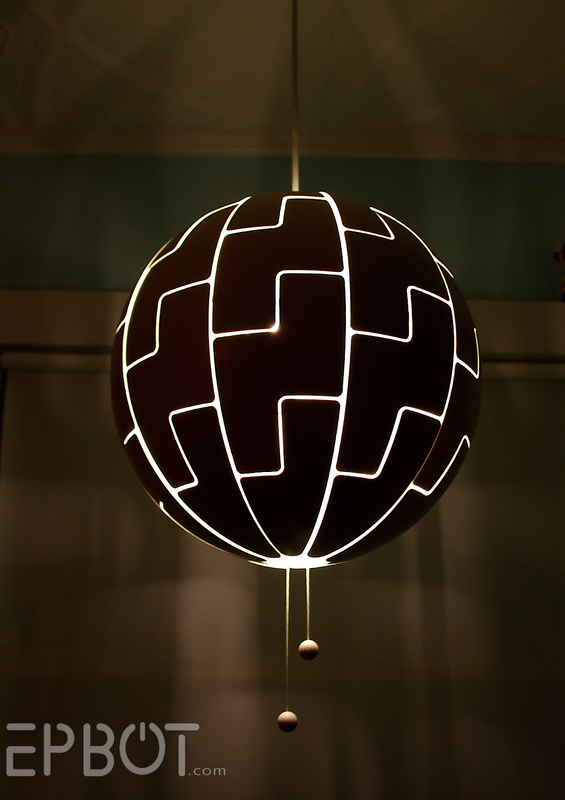 My office has had two plain paper globe lights for years, so as soon as I saw the new Death Star light (aka the Ikea PS 2014) in person I knew it was time for an upgrade. Ah, but we haven't gotten to the best part of these lights: THEY'RE ALSO TRANSFORMERS! 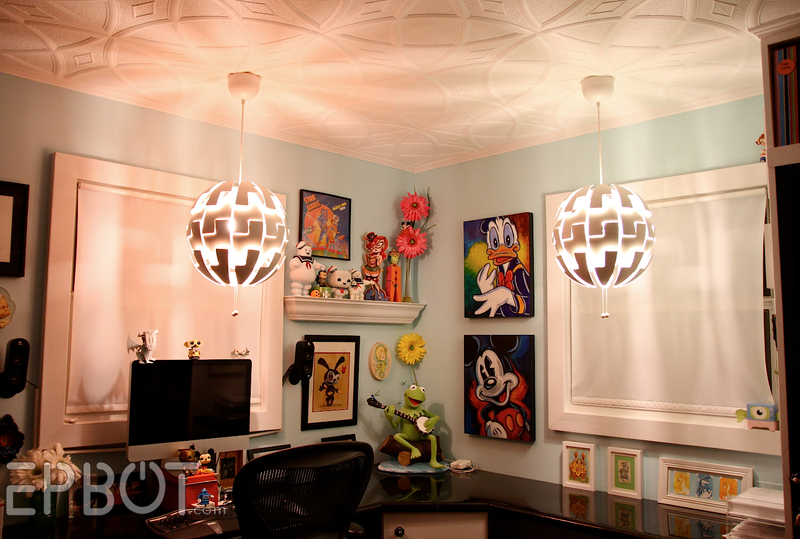 Now witness the power of this fully armed and functioning pendant light! That's less than half-way open, taken at night. And how's this for cute: the pulls are mini replicas of the globes! 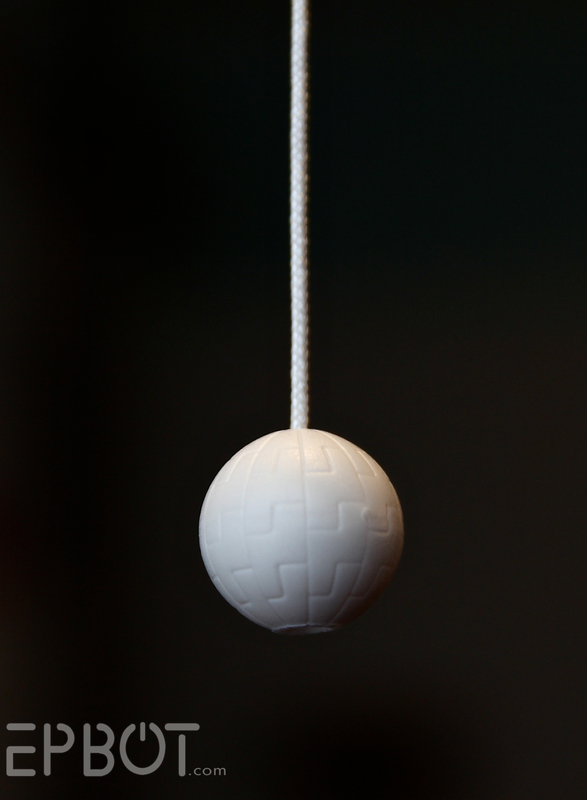 You can also tuck the draw strings up into the light; there are two little cradles at the base to hold the pulls. It's a real pain to reach, but a nice option for that extra streamlined look. These still shed less light than my old paper globes, since the thick plastic shields block the light instead of diffusing it, but I think it's a fair trade to get something that looks this nifty. Now I'm off to finish some new projects in the garage. Toodles! Those are so fun. Watching those lights open up is rather addicting! Can I live with you? Your office is just so peppy and fun! Love the lights! I had to smile when I saw your box cat. Best cat toys ever! I'm glad it seems to be that I'm not the only one who keeps boxes around for way longer than necessary just for the cats. How is she doing anyways? Better I hope. She's a gorgeous kitty. Thanks! Lily's doing SO much better on this latest round of steroids, which I guess supports the allergy hypothesis? Trouble is, vets don't like keeping cats on steroids long term. We convinced ours to give us more, though, and a half dose every other day seems to be doing the trick. Yes, I understand that problem. My cat Shadow had horrible summertime allergies, her nose would swell up and get welts. The vets told us steroids may shorten her lifespan. She made it to 12 then got cancer after suffering thru a couple of terrible kennel colds from new additions. So it's hard to say. If Lily was suffering as badly as it seemed though, it's definitely worth it. Hoping she can stay healthy! I went back in all the pictures to look for Lily :) I hope she's doing better! I keep tons of shipping boxes in my house for my cat to play in. Oh, my gosh-we have two boxes, so very tattered and worn that my two kitties sit in! I think if we ever dared get rid of 'boxies', the cats would leave with them! Your kitties are so lovely, and it's nice to see Lily out of her onesie still. Those lights are fantastic! And yes, I keep old shipping and shoe boxes in pretty much every room of the house! 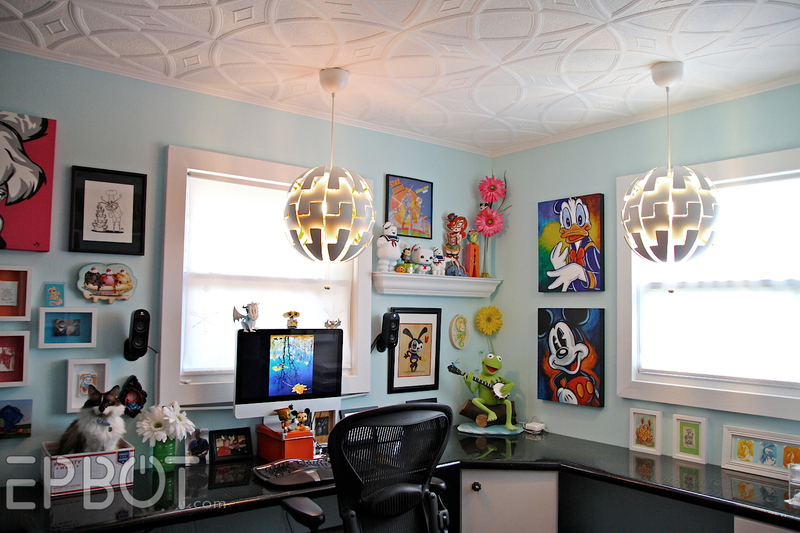 That is hands down the cleanest home office I've ever seen. I work from home too, and my desk is NEVER clean. It's a daily battle, tbh, and there's a small mound of clutter on the penny desk out of frame - plus three (yes, THREE) closets to close away the worst of it. With such a small office (it's only 10 X10), and as a person who actually LIKES a bit of clutter (hence the walls) I really have to keep it visually organized for my peace of mind. If it gets too chaotic I start to avoid the room all together - not good when I have to work here! Those looks so fun!! This weekend i am takeling my first ever "project" i am building a shelving unit with my friend from pallets.. I will send pics!! What the what? Those lights are fantastic- and in those colors, what a coincidence! Hmmm, looks like they're in stock at my local Ikea... time for some lingonberry sauce & meatballs- and shopping! Our closest IKEA is about 2 hours away and I have been trying to schedule a trip down there for at least a month! Now I have a couple more items to add to my shopping list! 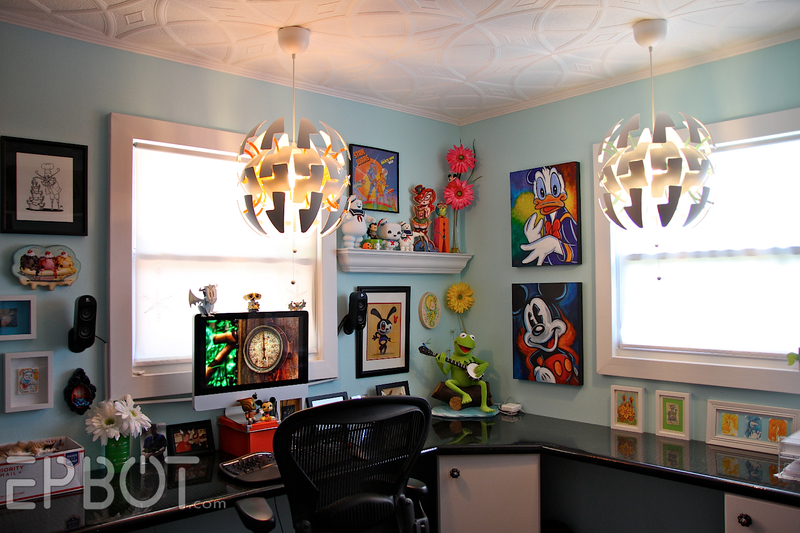 I'm also digging your home office - it's SO you! Oh, I would spend so much time playing with those lights. 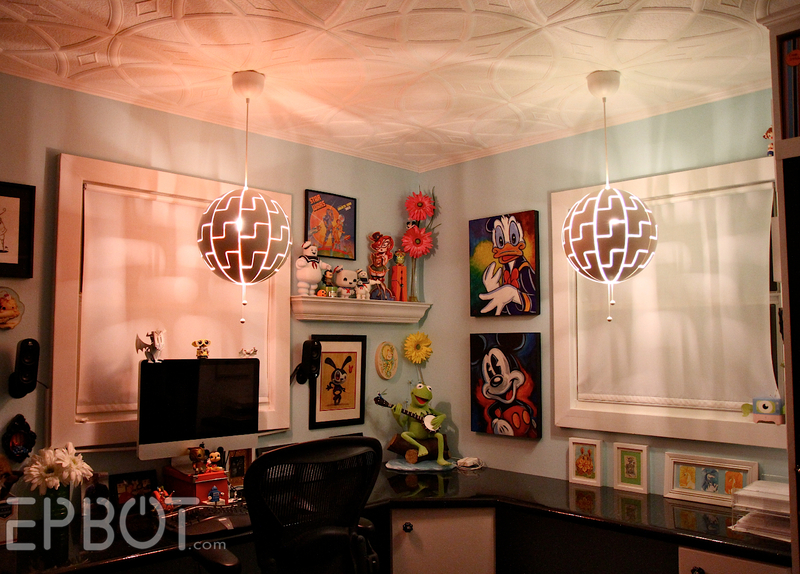 "Light open...light closed...light open...light closed..."
What wonderful pics of your office and Death Star! Thanks for sharing...I hoped to catch a glimpse of your computer walk station. Do you use it somewhere else? Love your websites! Yes, my treadmill desk is in the back living room - you can see pics of it here. We have a giant box (so it does not fit on desk) that our cat loves to play in. We keep it under our craft table so he can pretend he is involved especially since we don't like him on the table itself. The box is almost a year old and I don't have the heart to throw it out. Thankfully it is a good sturdy box cuz Stan Lee (the cat not the comic creator) is hard on boxes. The coolest thing is he can open and close the lid so you can never tell he is in there, it is a fun game when guests come over. Although I really like your new lights, i am super JEALOUS of the beautiful Kermit figurine you have. I have loved Kermie since I was 16---I am now over 50. Wonderful piece! Great lights, but I LOVE your Kermie! Good golly that is C.O.O.L!!!!!!! Love it -- you are right it is the right kind of trade-off. FABULOUS! And your office is a dream, especially with the kitteh! I have to share because this actually just happened: My three year old just looked over my shoulder at this post and said, "IT'S THE MOON!!" I got to say, "THAT'S NO MOON!" Those lights are awesome but I LOVE your ceiling! What is that up there? 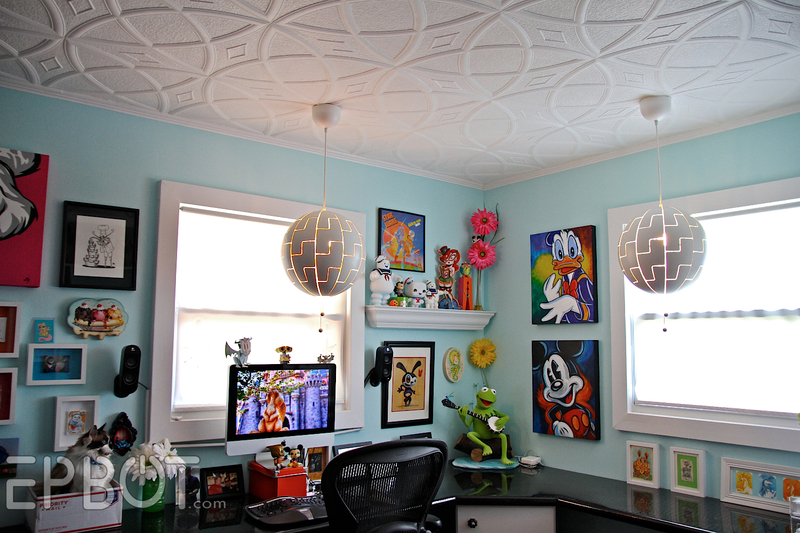 http://www.epbot.com/2013/02/diy-faux-tin-tile-ceiling.html she talks about the foam ceiling tiles here! (I now feel like a creeper... well Jen is the one who puts it out for public consumpiton.. ha! This framed and decorated Kitty Sit Box needs to happen now. Heather in Progress is right: frame the kitty! I wish I had an ikea, those lights are lovely. You do...right at your finger tips. Oh man I was just at Ikea and went straight past the lights! Hmm, I love my current lampshade but this might call for an upgrade if I can wrangle another trip. We don't have a cat, but our landing is covered in Sylvanian Families houses and cardboard boxes for our hamster to play in - he's very content to entertain himself climbing on cardigans, carrying pieces of paper around and rummaging around in a box full of tissue paper. The fully opened lights look a bit like Portal turrets to me. As always with Ikea stuff, they seem to strike a good balance between function and utility. Totally unrelated: my husband and I are off to ConCarolinas this evening. If I get any good photos, I'll send them. Actually, I think the best part of your office IS The Cat in the Shipping Box! The box needs to be decorated to best suit to highlight Lily's beauty. And yes, move the art around so she SHINES. Spoken as a woman who had a padded box on her desk for years for the office cat (Little Sister) to snooze in. What a great work room! Mine looks like an explosion at the paper factory. I do have myself a fancy kitty sitting box, though--100% bonafide, corrugated cardboard, complete with fancy kitty. Although she's in the window sill right now, enjoying the fact that Pittsburgh is finally having spring. Glad to hear that Lily is doing better now. I love your office! Is all of your desk the penny desk? Does John share that space with you? I love your new lights but please tell me about that Kermit on your desk. He is so cute I am dying! OMG! We moved to a smaller house a year ago & have been having fun collecting mid-century modern for it. We do have a vintage pole lamp, but we had to completely re-wire it & don't want to deal with that again. Have been wanting a lamp we could swag over the coffee table/dog hangout next to the couch. This is IT! Love your beautiful office! It's so happy and cheery. 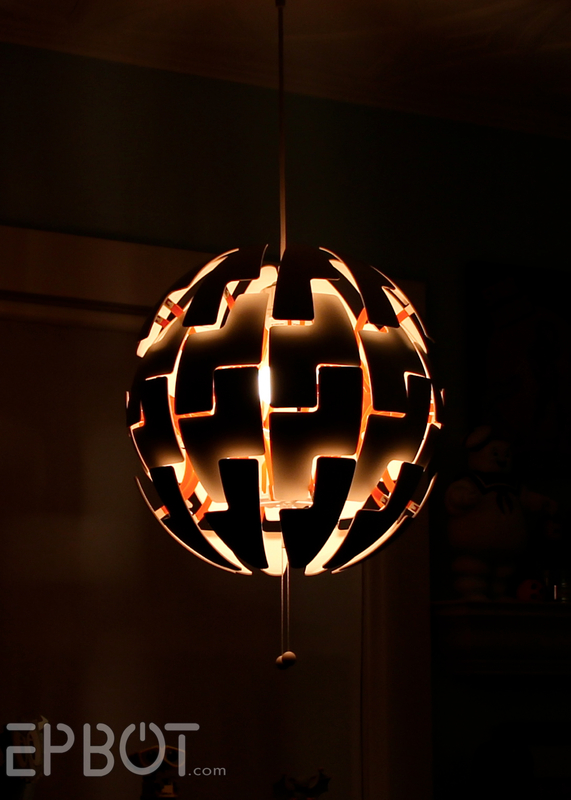 We have the same light in my son's room and we call it the Death Star, too!!! :D This made us all smile! Aahhhhhh! I want those lights!!! I just have to say: Your office makes me happy! Such a fun place to work! And yes, we get boxes in almost daily, so our cat has a fresh one to hop in all the time. We keep our (Harry and David pear) box on the floor in front of the heating vent. The cats love it there! I have an old mandarin orange box on the floor of my kitchen that my cat curls up in when I'm cooking. Sometimes I accidentally drop bits of food on her, but she doesn't seem to mind. I love these lights! We are renting now, but I can't wait until we own, so I can get some cool lights from Ikea. I have started forcing myself to walk past the lights without looking at them, because it just upsets me that I can't buy any. Soon, soon. Joining in with the rest of the Cat Crowd who all have boxes on their desks! And the lights are pretty cool, too! :-) H.
I just love your office!!! It's so fun with all the colorful art on the wall!